To feed the growing world population, sustainable intensification of food production is required. In 2050, the agriculture production will increase with 60% to comply to the demand of food. In the same year, the world population will have increased to approximately nine billion people. In The Netherlands there is a long history of developing crops, but also of livestock and poultry farming. A lot of knowledge has developed from this sector. This specific knowledge is used for further developments in mechanization and automatization in the agricultural business. BUWATEC supplies tanks for storage of manure, sludge and irrigation. 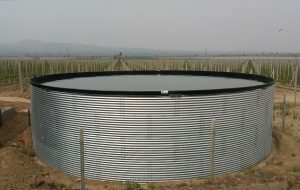 BUWATEC supplies manure tanks as well as water tanks in the agriculture segment. The tanks are constructed of corrugated and curved metal sheet parts. These steel parts are connected with bolt sets and form the basics of a manure and irrigation tank. In combination with a liner, cover and accessories, these parts form a complete slurry tank with the required capacity. Liquid manure is named dung, slurry or simply liquid manure. In the agricultural business we use the slurry or liquid manure to spread over or inject into the farmland. Farmers store the liquid manure in BUWATEC manure or slurry tanks. 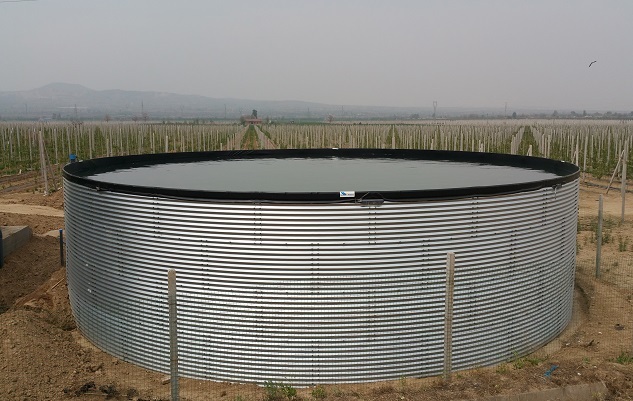 In the Netherlands, this type of water storage tanks needs an official KIWA quality certificate, which qualifies the combination of the tank, liner and cover as a complete storage system. Specialized and qualified installation companies will carry out the installation of these manure storage systems. These companies also supply the additional peripherals such as manure mixers, manure pumps and manure valves. An important part of the certification is the obligation to check the installation on functionality and status of the material after a period of 10 years. Irrigation means using different technical equipment, enabling farmers to use water for their crops, when the natural resources are not sufficient. Irrigation allows for growing crops with a higher yield. In general, 94% of the watering of crops is done by sprinkler or surface irrigation. The other 6% take place with the more cost intensive and sophisticated techniques such as drip irrigation. In most cases these techniques are based on using ground water with a process of purification. BUWATEC supplies the infrastructure for water purification and water treatment, as well as water storage system for ground or treated water. Slurry tanks are designed as self-installation packages. Manure tanks are always supplied including our unique coating system for maximum durability. Slurry tanks will be transported on pallets, efficiently orientated for export. Flexibility, modularity and sustainability of the slurry tank system. Everything can be built on location with hand tools only.